Digging through some old photo’s the other day inspired us to share the story of how it all started. Back in 2002, Ruth & Andrew would regularly make the 2 hour trip from Franschhoek to a small cottage they had in Paternoster on weekends. At the time the village could only be reached by dirt road and many artists, pioneers and dreamers were drawn to Paternoster. 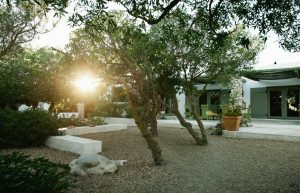 Attracted to the wild terrain of the Strandveld surrounding the small West Coast village they kept an eye out for a place where Andrew could build a wood-working workshop, Ruth could pursue her love of creating and they could settle for the long term. Through a series of real estate trials and errors eventually the plot, which was once part of a large farm called Pelgrimsrust, became their home. For Ruth and Andrew it was not love at first sight as there was only a dilapidated manager’s house on the land and much work needed to be done. However the beautiful trees (very scarce on the West Coast) appealed to Ruth and they had the necessary space to build a workshop. 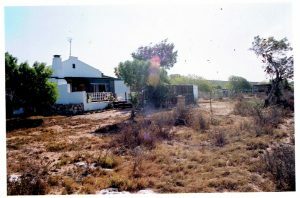 Over the years they built the two cottages to offer accommodation as tourism in Paternoster took off. Their niece Cindy, a corporate city girl from Durban, came to visit and fell in love with the country life and the local Paternoster vibe. The wedding venue Joy was created and Cindy moved her life to the West Coast to join the Gelukkie family team. Why Gelukkie? Ruth remembers her dad saying “Geluk by die Ongeluk” meaning that with every hardship there is good fortune so together with the experience of happiness and joy they hoped to create, Gelukkie was named.